I utilized the McDonalds in town for a quick breakfast before getting up to the freeway exit to start the day of cycling. 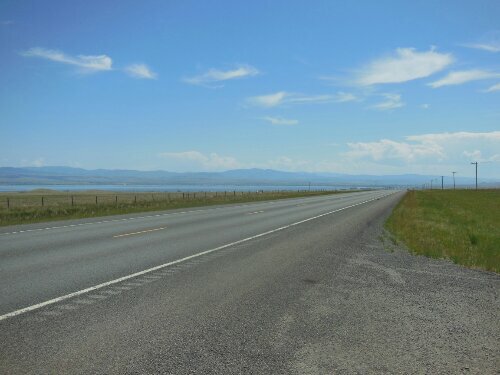 My route continued northeast on the freeway alongside the Lewis and Clark trail on Old Highway 10 and the Yellowstone River. 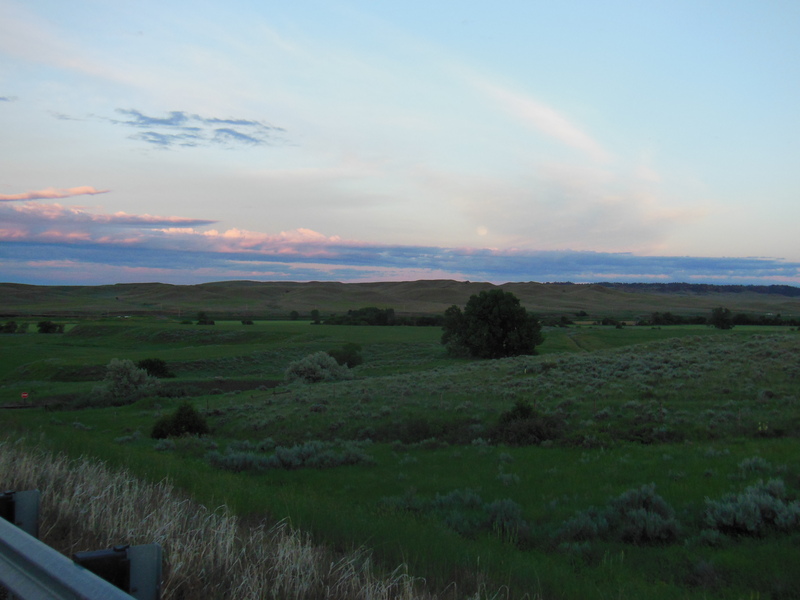 Nothing surprised me all of the way to Glendive as the landscape continued without change. Getting to Glendive, numerous options concerning where to stay confronted me. Makoshika State Park was an option, but it was still on the southwest part of Glendive and it would include a bit of a trek off of my intended path. I looked on my phone and found a campground on the east side of town. After haggling over the price of my site for the night, I landed a considerable discount. The campground, close to the western border of North Dakota, was quite full for it being mid-week. Then I realized many of the campers there likely housed people in the oil industry. The oil boom even had an impact out here. My campsite was nestled between two guys working in ND and a mother and son from Canada who were visiting relatives down here in the states. The Canadiens offered me some of their food, which I gladly accepted to compliment my chili, while the two buff oil workers offered nothing but loud music and obnoxious shouting between them. 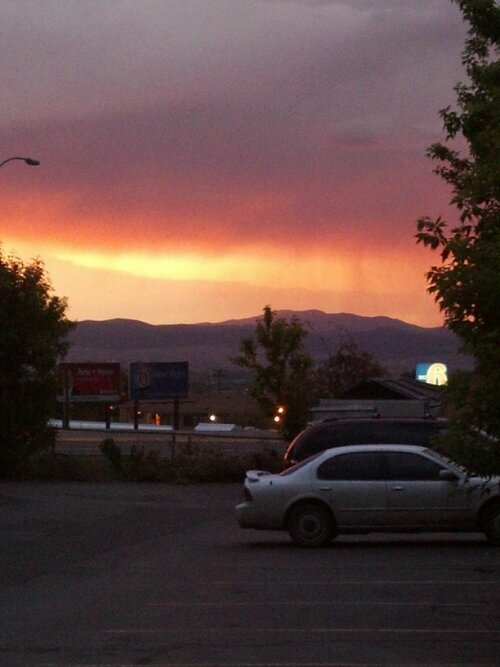 This is my last night here in Big Sky Country. After getting packed up and the tires back on Rambow, I stopped at the workplace of my host to give a final good bye. While I was there, a lady from the local newspaper stopped by and jotted down info for a newspaper article. 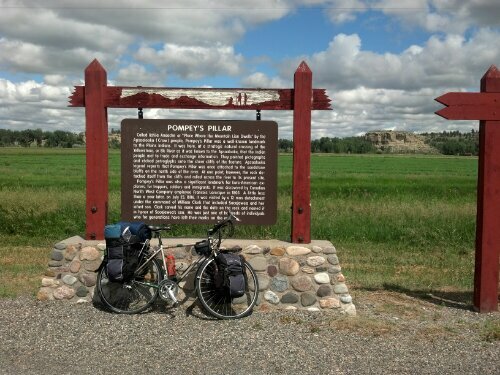 I was told of spots I could eat and camp along the way east of Forsyth, said goodbye, and headed off. The new 28mm tires that I put on really felt good on the ride. The decreased surface area of the tires on the road helped my speed and coasting ability despite the crosswinds and headwinds that I fought with east of Forsyth. I noticed a broken spoke on my tire and some loose ones just 7 miles out of Forsyth. Thinking that this likely came from my whole ordeal the previous 2 days, I became nervous not knowing how well it would hold up for the next 200 miles til the next big town, Dickinson, ND. I rode on. 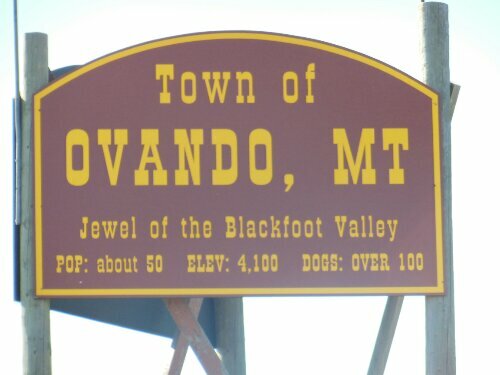 The 2nd dog attack of the trip happened just west of Rosebud, MT. About 100 feet before passing the driveway, I noticed a dog get up from it’s perch on the deck next to the house. It proceeded to bolt toward the road. I sped up and made it to the intersection of the driveway and the frontage road just before the dog made it. No harm done. 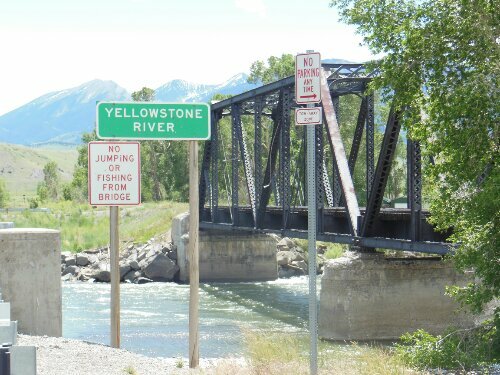 My route parallelled the Yellowstone River all of the way to Miles City where I decided to spend the night. At the Dairy Queen, one lady donated $15 to the cause. 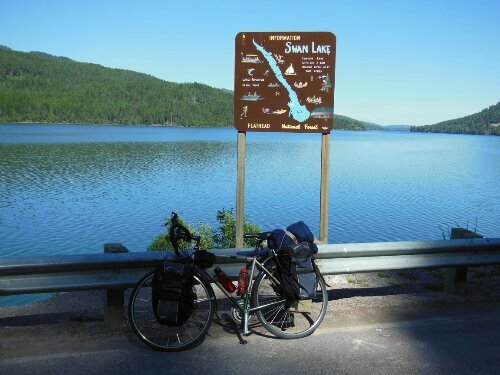 Multiple other people inquired about the trip, as usual, and one couple also looked at my bike and talked to me about it as they themselves did some cycling too. 3.7 miles separates the Miles City Dairy Queen and the Big Sky campground where I stayed. Big Sky campground has been the best camping experience so far. They gave me a great break on the camping rate. $5 got me a tent site, shower, pool access, wifi in the entire park, and a porch area by the clubhouse. Not to mention the wonderful people I would meet. I lounged at the porch by the clubhouse, eating my goldfish crackers and cookies from church yesterday morning. As I typed away on this blog, I met a couple from Belgrade, MN. After chatting with them for a while, the owners of the park offered me some free food and drink. I politely declined as I was still full from Dairy Queen, but I did accept a can of Coke. On the way back to my campsite, in the corner but still with good wifi reception, I struck up conversation with a couple who were camping at the site next to me. They were very nice. We talked for over an hour about their travels and mine. They gave me more inspiring words to keep on my mission, not just for this trip, but for my life. I will always remember them. 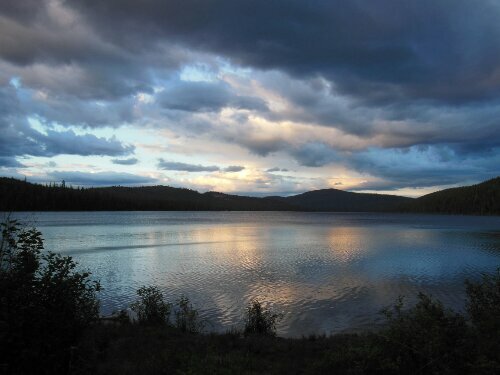 The day came to a close in the northeast corner of the half-full Big Sky campground in my tent. I was ready for another day. A relaxing, hospitable day followed yesterday’s crazy night. I attended church at Immaculate Conception Catholic church at 9:00 a.m. After mass, snacks were served in the gathering area on the way out of the church. Making my way into line to be served, a sociable, older man started conversation. Soon after, a small group of people were talking with me. Before getting any food, someone donated $10 to the cause and many were fascinated with my trip. The servers of the snacks were quite interested as well. At the table, I talked with the friendly people of the church before leaving. Getting ready to go, a surprise gift consisting of the extra snacks packed up in a box for me on my journey was presented to me from the servers. I couldn’t move without experiencing hospitality. 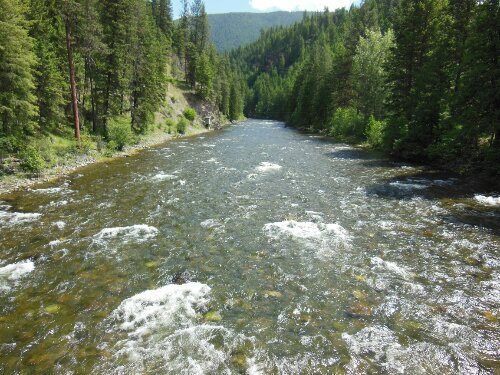 I walked back to the host’s house, not far from the church, taking in every breath of warm, refreshing, Montana air. The temperature, sunshine, and lack of pestering mosquitoes really allowed me to enjoy this time off of my bike. My hosts, wonderful as they are, continued garnering support from the community and really became an ally to raising awareness and support for my cause. Before we left to Billings, a stop at Top That Eatery yielded me free lunch (I know you economics buffs out there will dispute this and it’s true, there is no such thing as a free lunch). The workers there knew who I was through the Facebook vine even before I set foot in the place. Everyone in town knew me. 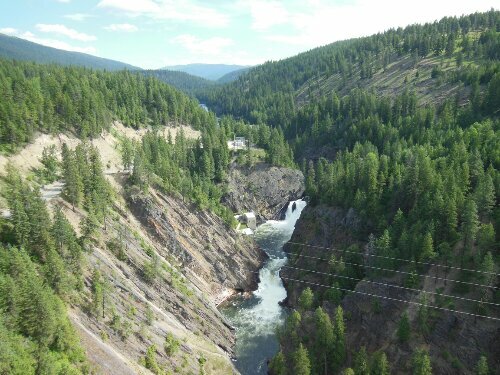 The 100 mile drive to Billings retraced the route I traveled just the day before. This time, however, much faster and without incident. The Spoke Shop was open today and offered what Rambow (my bike) needed to get back on the road again. I knew the tires I had were a large part of the plague of flat tires I’ve had so far, so I looked at tires as well as getting extra inner tubes. I left the Spoke Shop with 2 new tires and 4 inner tubes. My gracious, generous hosts ended up purchasing the tires to contribute to my cause and the guy assisting with the purchase gave me the inner tubes for half price. After enjoying some cookie pizza and ice cream to celebrate the birthday of one of the daughters of my hosts, we drove back to Forsyth. I put one of the tires on my bike before it was time for the showing of Man of Steel at the Roxy Theatre in town. The hospitality continued with free concessions for me. The evening ended with some pizza and the installation of the new tires on my bike. My wonderful hosts insisted that I stay a day, so I did. The rest, well deserved, helped me learn more about the area. Took a tour around the city, drove through Native American reservation land, saw a house that was built on Extreme Makeover Home Edition, and had a great conversation with the other cyclist. My hosts provided great food and conversation. Despite not making it any farther physically on the journey today, the rest and history of the area made the day productive. Sleep was rather difficult last night. After the local riff-raff from the bar finished wandering the park and exchanging their “goods” (around 11:30 p.m.) I figured the rest of the night I’d be able to sleep easy. The water sprinklers at 3:22 a.m. proved me wrong. Two sprinklers in particular had a direct spray on the tent every time they spun around. It would have been worse if I placed the tent over the top of one, which would have meant certain soaking, but the tent held up formidably, and all belongings stayed dry. Other than that and the four trains that passed through the night two blocks away, I was able to sleep. 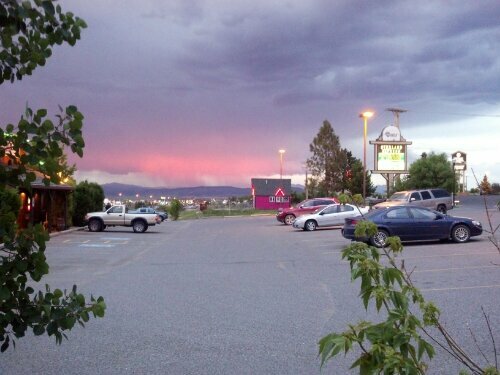 Laughing about the previous night, my eyes set sights on Bozeman. Three Forks, the halfway mark, offered a Subway that I utilized for lunch. 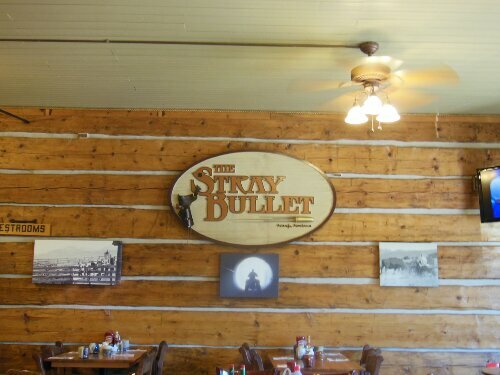 It was here in Three Forks that I began journeying on interstate 90. 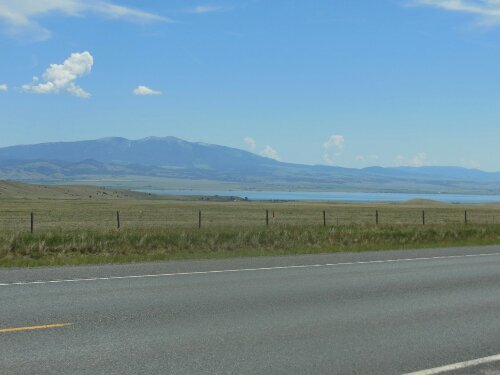 The faster traffic, flat roads, and wider shoulder provided a faster, easier means of cycling, but at the price of much less picturesque landscape to lay one’s eyes upon. 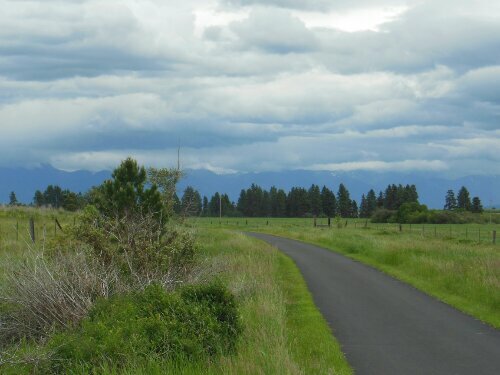 I utilized the facilities at the rest area near Bozeman and spent some time in the shade working on this blog until the rain clouds began approaching. I hurried off to get to my host’s house. Thankfully he was off work early today, as my arrival was premature of the agreed on time. He showed me the fully furnished guest house where I could spend the night and suggested a co-op down the road in town for dinner. After showering, while a brief shower passed outside as well, food was priority. I usually tend to listen to the locals when it comes to places to eat and routes to take. Listening to the co-op suggestion paid dividends. 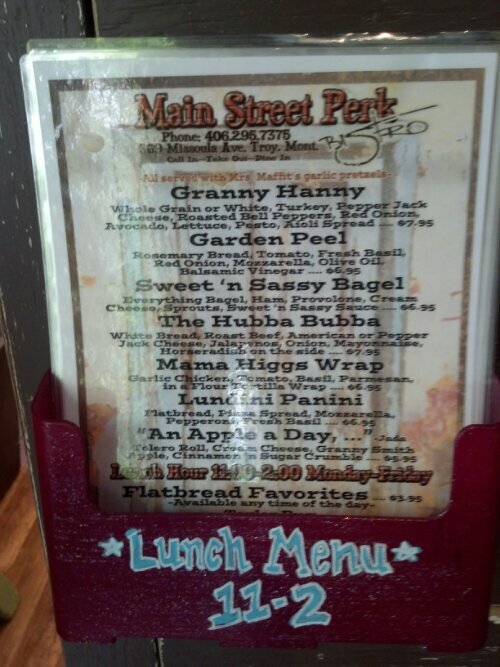 This place on the main drag in downtown Bozeman (one of my favorite cities) offers many different organic food and fresh food options. Today, Asian food was a special where you could fill your plate and pay by the pound. They also offered a deli and sandwich options. All of this was at a surprisingly good value. The rest of the evening consisted of watching hockey, working on the blog, and conversing with my great host, who had been a park ranger for the National Park Service for over 20 years. 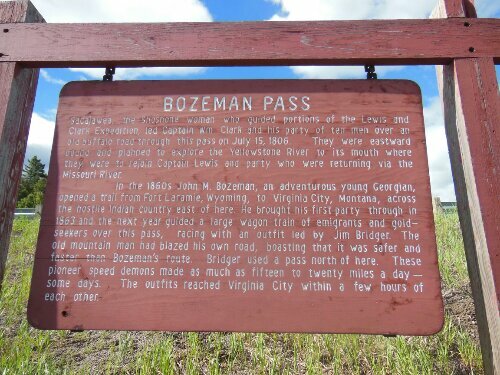 To me, Bozeman is one of those great cities I would like to live in. Maybe some day I will. 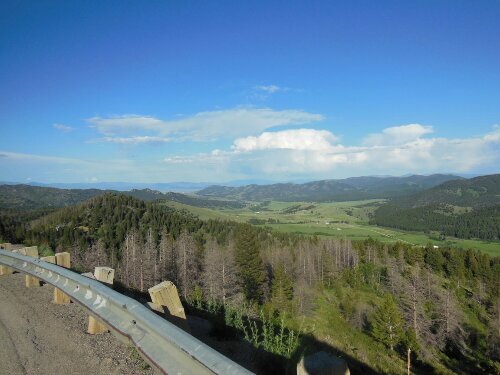 After a free, pleasant breakfast, a long but gradual climb out of Helena and a brutal 15-25 mph constant slap in the face of a headwind created a nightmare. 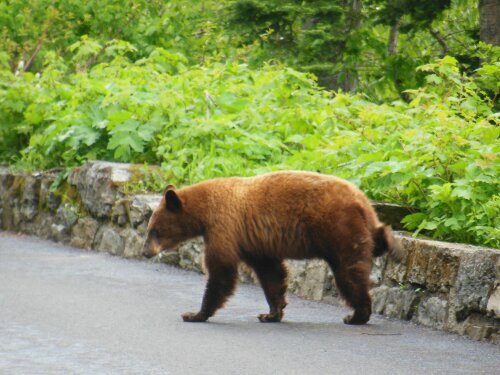 34 miles is all I could bear today. Nothing has irked me more than the incessant ESE wind that I’ve been battling with for 3 days now. Today was by far the worst. 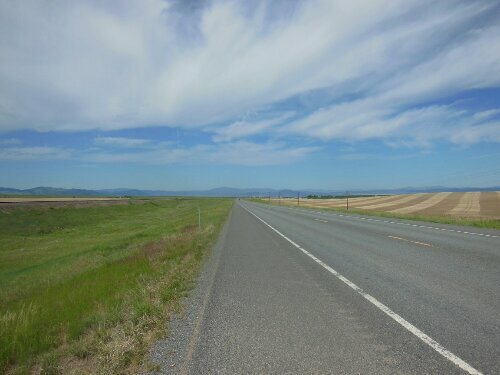 Going on flat road east of Helena, and even downhill as I passed Winston in sight of Canyon Ferry lake toward Townsend, coasting at all was unthinkable. Cycling in a slight breeze is one thing, but on a touring bike with 35+ pounds of gear, extra wind resistance, and a 20 mph wind in your face, not to mention 90 degree temperatures, going any measurable distance is brutal. Arriving in Townsend and locating a park, I ate to replenish my energy supply and sat down to consider my options. 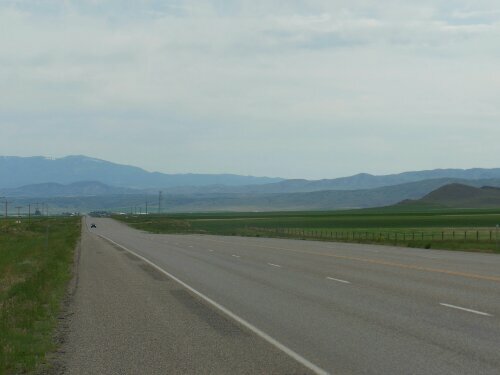 35 miles remained to get to the next town of Three Forks. That would match the distance today plus add an uphill climb as the route follows the Missouri River upstream. Noticing clouds building in the sky, wind continuing, I checked the radar on my phone to discover the area was in a thunderstorm watch. That was the final straw. I decided to hunker down for the rest if the day and night. An elderly lady walked by as I sat in the shade of a tree on a park bench and asked if I would be camping the night at the park. Not knowing if that was commonplace, she went on to say that people often camp in Colonial Park. 10 minutes later I had my place for the night after calling the city office and verifying it was okay. 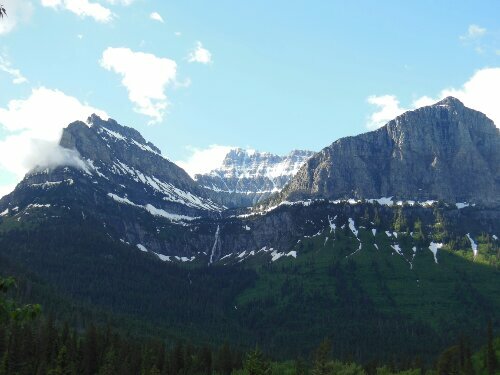 I feel financially this may work out better as I would have had to pay at my intended destination (Missouri Headwaters State Park) and I’ll still be able to make it to Bozeman tomorrow where I contacted and confirmed a host. As I finished eating my chili and noodles in the park, two boys from town biked over to inquire my situation. They were intrigued at the thought of going hundreds of miles by bike. Our interesting conversation was cut short as their friend was anxious to get to their favorite pond by the river to catch snakes, a rather popular activity for the youth here. Not long after, some members of the Rotary Club brought tables on trailers to the park. I decided to offer some assistance. They were grateful for the help, and I was glad that the leather work gloves my mother suggested I bring along finally found some use on the trip. Thanks mom! One of the Rotarians turned out to be from Richmond, MN, little more than 10 miles from where I’ve grown up. We talked for a little while. It was nice to get some sense of home while still being 900 miles away. Evening arrived and I found myself writing these words and charging my phone when an older couple walked from the gas station with some food. They sat at a table near to me. Before I knew it, I was once again telling the story of my adventure and cause. The couple, from Bozeman, found it fascinating and took down my blog site. They then left, but not before giving me the last two peices of chicken they had. I set up camp as darkness settled over the park, ready for a night of sleep. Little did I know that’s not what was in store. Packed up camp relatively early this morning. A coating of dew lined the outside of the tent after a relatively pleasant night. I stopped at the rest area right off of Highway 200, one mile from where I camped to do a quick cell phone charge and water bottle refill. Two things really started to get to me today. First off was the climbing. Hills would take me up a little ways, but then, much to my dismay, they would go down again. 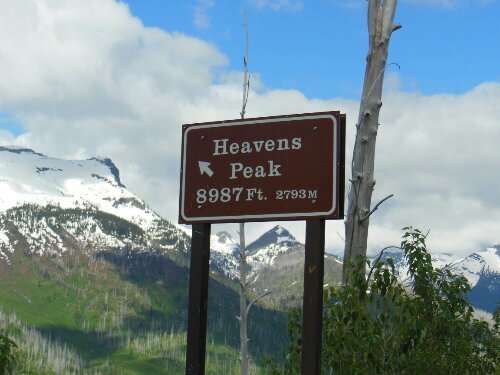 One would think going down would be great, but when you know that crossing a mountain pass is on the agenda for the day, you don’t want to go down until you’re over the pass. By far the largest inconvenience for the day, however, was the wind. I chose to go west to east for the principal reason that the winds are almost always from the west, making it easier for me to pedal along. The opposite was true today. A perfectly horrible ESE wind blew into my face almost all day. One event that could not be overlooked today was the dog attack. 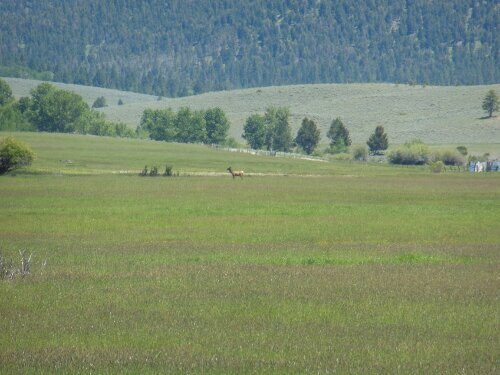 About 15 miles west of Avon, MT, I was passing a residence not too terribly far from the road. As I was even with the house and passing by, a sprinting, barking dog bolted from behind an old, rickety fence. My pedaling rate instantly doubled. I reached the maximum running speed of the dog as it was within 5 or 6 feet of my bike. The distance between the dog and myself grew slowly until the dog gave up about 1/5 of a mile from the house. 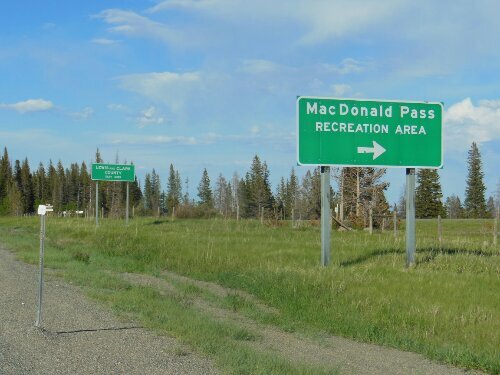 The turning point for the day was definitely reaching the pinnacle of MacDonald pass at 6,325 ft. 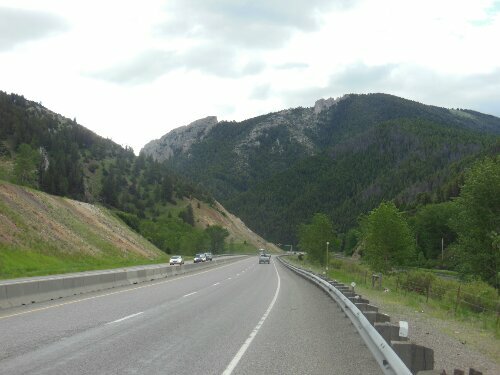 The exhilarating ride down included passing semis and logging trucks at speeds up to 35 mph. I could have went faster, but knowing a little mishap would mean serious injury at best, I played it safe on the speed. After exhausting all momentum at the bottom, 10 miles separated me from the discounted motel room at Super 8 that I reserved a few miles back when I was at the cafe in Avon (Ironically Avon, MT marked my halfway point of the trip to Avon, MN almost to the mile). The rain drops began to fall as Super 8 was in sight. 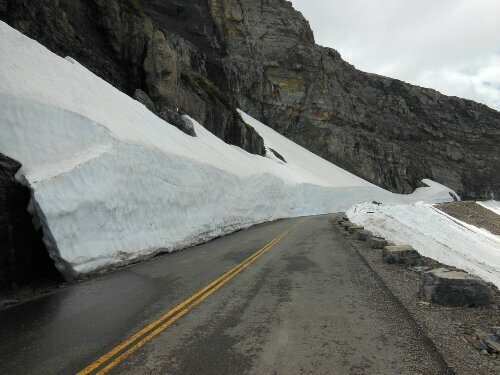 Today easily rivaled the day I went over Washington Pass as the most difficult day of cycling I’ve had. 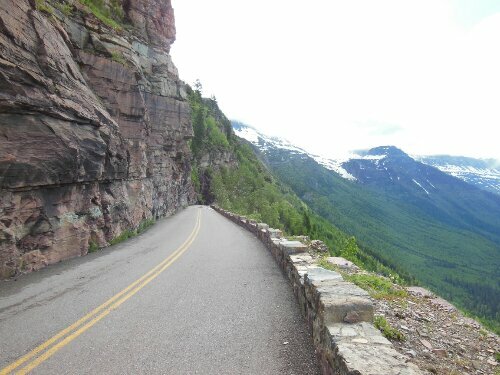 Rode the ups and downs of the scenic but desolate Hwy. 83. 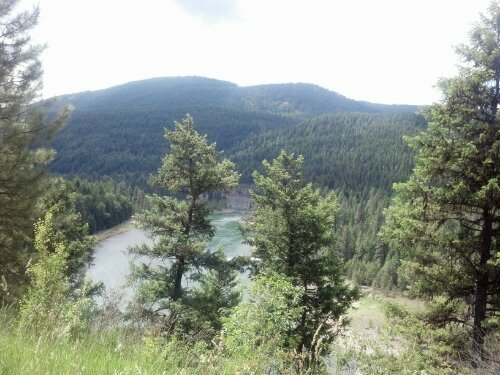 A couple nice lakes along the side of the route today included the lakes Swan, Alva, Inez, Seeley, and Salmon. 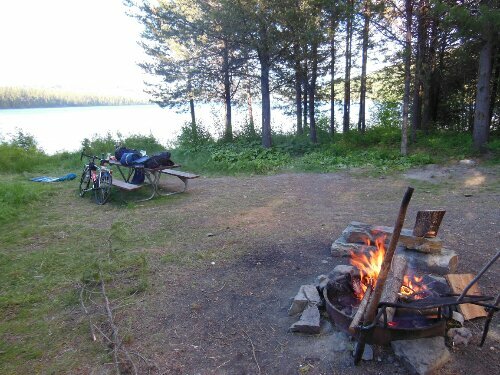 All day, I looked for a day use area with a picnic table or place where I could effectively cook some noodles with my campstove, rather than the hassle of making my own makeshift camp, the breakfast sandwich in Bigfork and 3 bananas lasted me all day until I made it to where I would camp – a long story. Because the day was going to be a long one, feasible places to stay were Seeley Lake, and Salmon Lake State Park if I needed it that far. 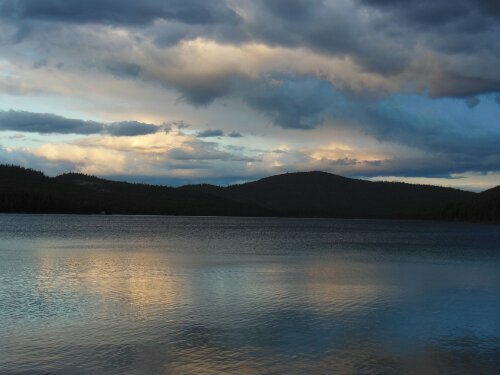 I made it to Seeley Lake and had time to spare, so I figured I’d push on the extra 8 miles to get to Salmon Lake State Park. Upon arrival there, the outrageous price of a simple campsite put me right back on my bike and down the road another 7 miles. This place was right at the junction of Hwy. 83 and Hwy. 200. 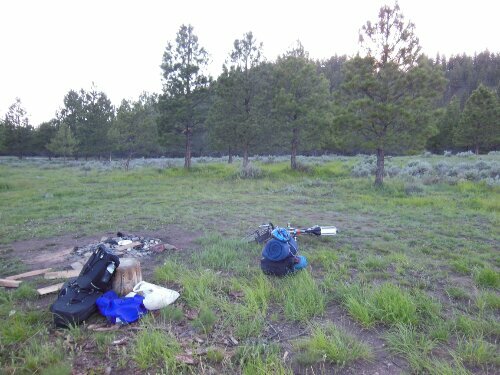 I arrived at this more primitive, but wildly more affordable camping area, and spoke with some people there – the news got better however as they said I could camp for free on the other side of the river! 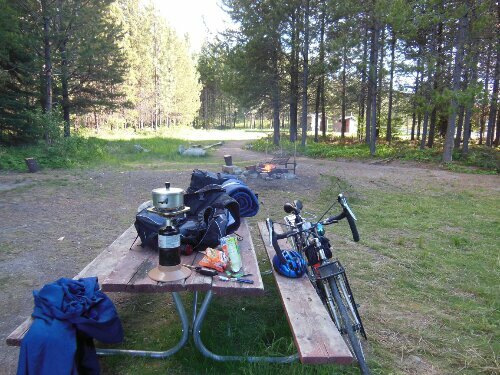 There were no fire pits or picnic tables on that side, but free camping could not be argued with. I will let the pictures do most of the talking as words, no matter how exquisite, cannot portray the vastness or beauty. 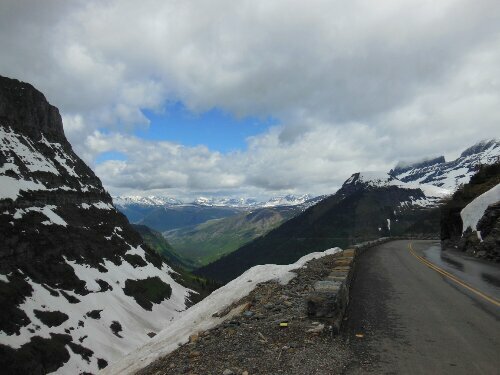 When in this place, the majesty of the mountains and grandeur of the glaciers shock the visual sense of any human. Here, one obtains more wisdom than any other and the only knowledge one ever needs to know, the way of the land. 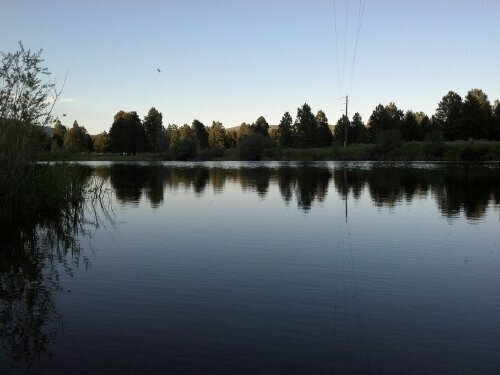 I know no stress here, for nature provides all outlets for my thoughts and awe. 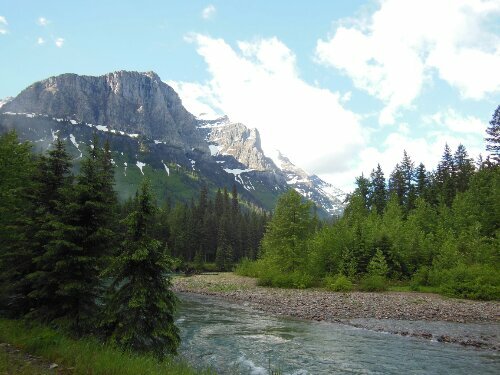 Unmatched beauty, pristine land, and awesome wilderness. I hope this land remains for all generations to come. It needs to be preserved and protected, so all can know the value of untouched wilderness that once covered the entire globe. This one snuck up on me! 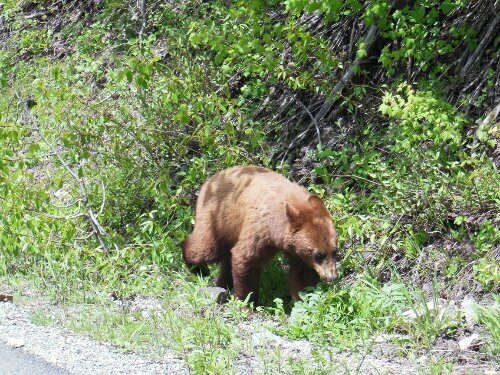 I stopped for a short rest and he popped up over the side onto the road! Thankfully I didn’t startle him, I was easily within 40 feet of this guy. 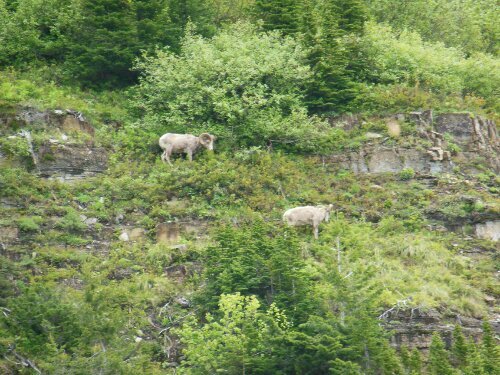 A couple miles ahead (and up), I saw these bighorn sheep. There were 4 total. 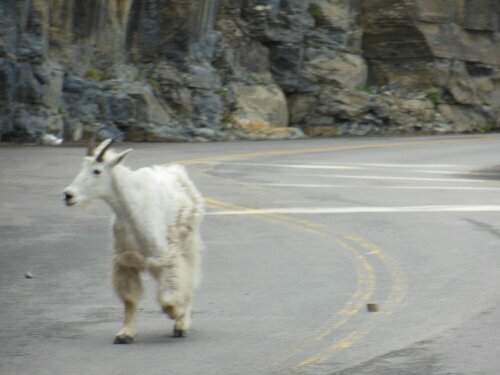 One mile later, this guy got trapped on the road between two hikers on their way down, and me on my way up. 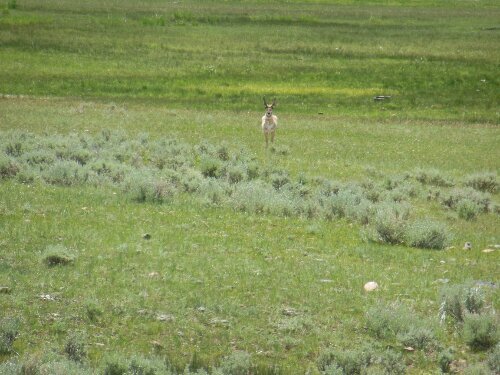 It ran toward me very quickly, within 30 feet, I steadied my camera as best I could and got this shot. 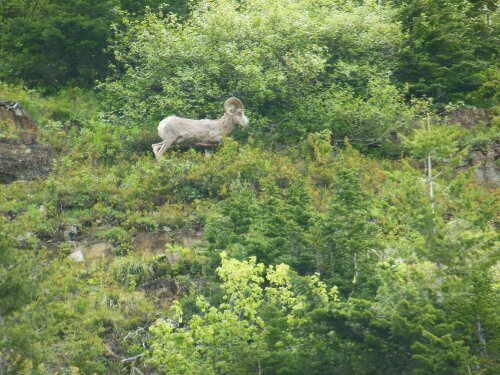 Also have a video of it scaling the rock face right next to the road as I stood and watched in awe. Saw this on the way down! 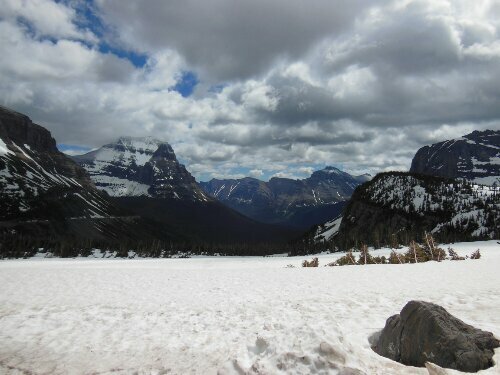 Overall great day here at Glacier National Park. More photos to come after my tour. After a gorgeous sunset to end the previous day, a rather interesting, restless night ensued. The chilly night air dropped in temperature to the low 40’s. 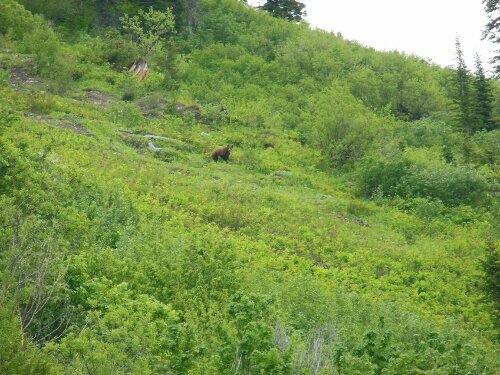 Bears were also on my mind, as this area had an extremely high number of bears. The night passed however, and I was on my way before the clouds thickened. A deer carcass 2 miles from camp along the roadside was a meal for a Bald Eagle. 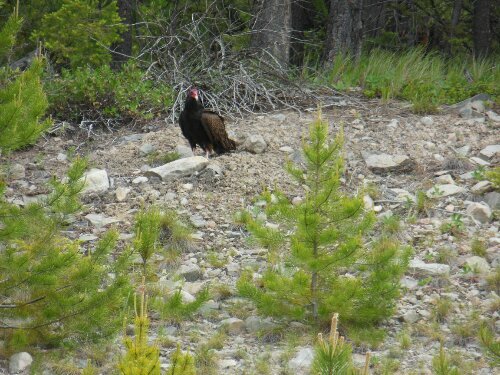 I interrupted the feeding spree only 20 feet from the eagle, giving me a quick glimpse of this magnificent bird. After hugging the side of Hwy. 2, with no shoulder, for 2 hours, the Dashboard Diner in Marion attracted me. Some sausage, eggs, and pancakes provided some uplift on the rather dreary morning. 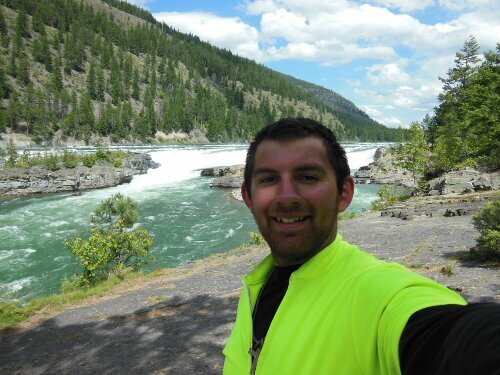 The waitress said I was the 3rd cyclist that stopped for the year, but what she said after that, the fact that it was all downhill to Kalispell, really sparked a new enthusiasm for me. 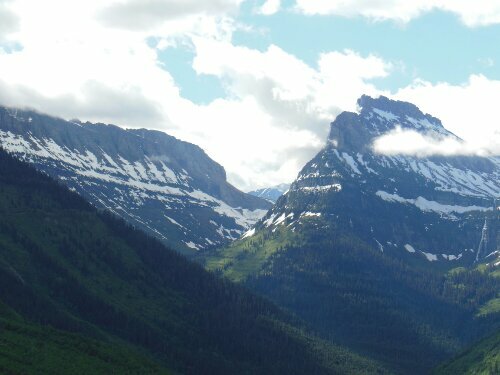 By the time I was 8 miles from Kalispell another pleasant surprise struck! 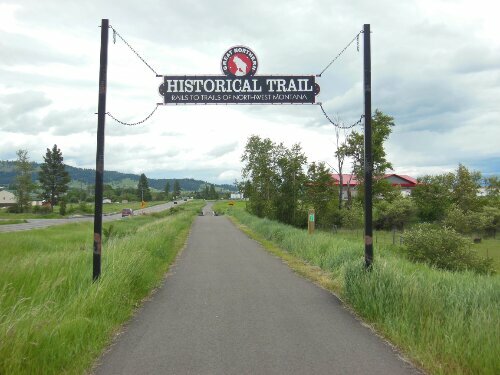 A rails-to-trails bike trail! 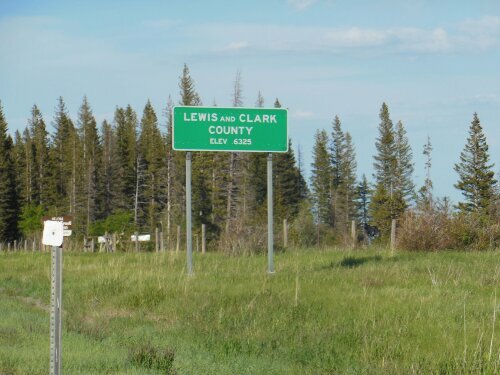 I bypassed Kalispell, through Sommers, and headed to my place for the night in Bigfork, another great host. Flathead lake, at over 165 square miles, is the largest freshwater lake west of the Mississippi. 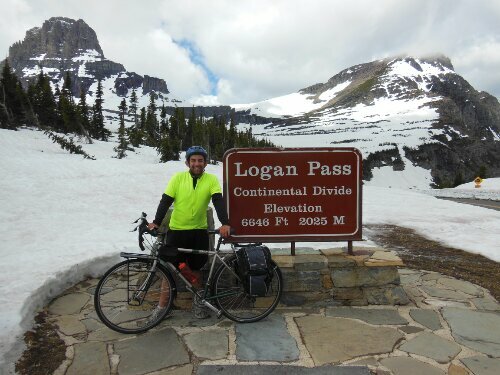 While I ate dinner with the hosts, in their house with a marvelous view of the lake, the wife mentioned she was driving to West Glacier Park and biking up the west side to Logan Pass, she offered that I come along to bike and take pictures. This offer was too hard to pass up! 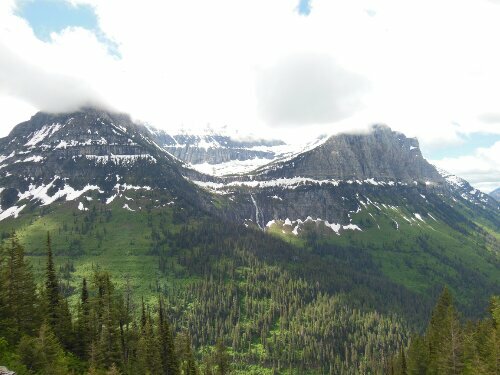 Tomorrow I’ll be spending a day in Glacier National Park. Picture perfect ending to an otherwise average day on the road. It seems as though climbing dominated today and the pestering headwind that blasted my face for a considerable portion of the day didn’t help the ride or my mental state for that matter. In addition to those two annoying cycling circumstances, a light rain fell for two abbreviated segments. Though slightly refreshing as it was very light, the fear of not knowing how much or the rate of rainfall is enough to keep a cyclist even more uncomfortably close to the edge of their bike seat. Another notable but not nice part of the day stretched for a few miles along the route today – road construction. Rocky roads and absent shoulders were crossed alongside logging trucks, semis, and RV’s. The tavern and eatery 10 miles from the pristine waters of McGregor lake provided good grub and nourished me till my destination. 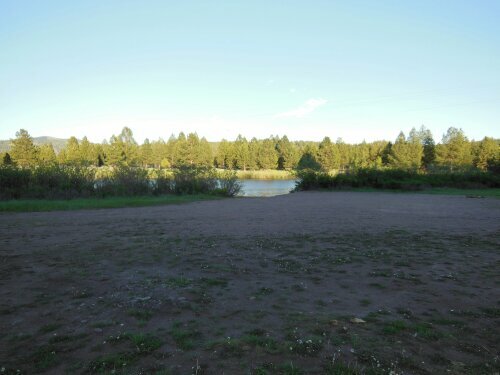 The campground offered much open space and quiet as there were only two other parties, including the camp hosts, in the entire campground. Scenic can describe the day very well. Bob and his wife prepared a wonderful breakfast for me to start the day (I still cannot express how grateful I am to hosts for the night stays and food they provide). A good start to a day of touring in the west involves a climb. 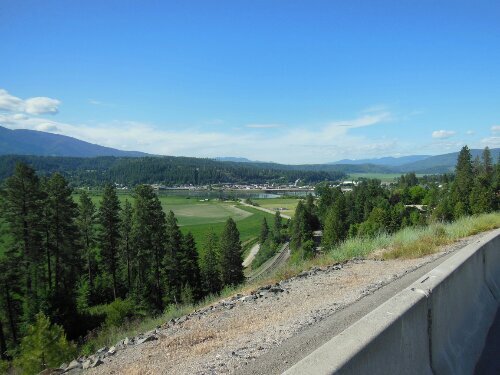 Bonners Ferry offered a good climb going out of town on Highway 2 and thankfully provided a good view to reward me for the work. 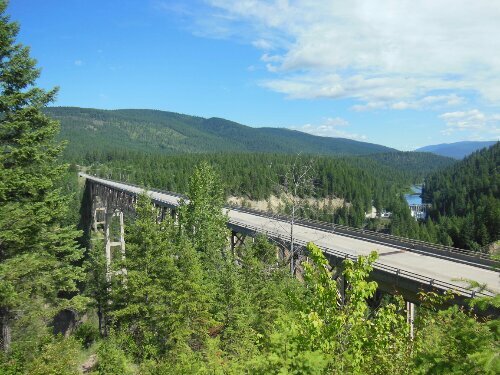 The highlight of the morning couldn’t have been much more spectacular than crossing the bridge 464ft over the Moyie River. In Troy, as I cycled through town, a nice one I might add, looking for a little cafe or place to eat, a bicycle with panniers caught my eye at a little place on main street. Inside I met Max from California. 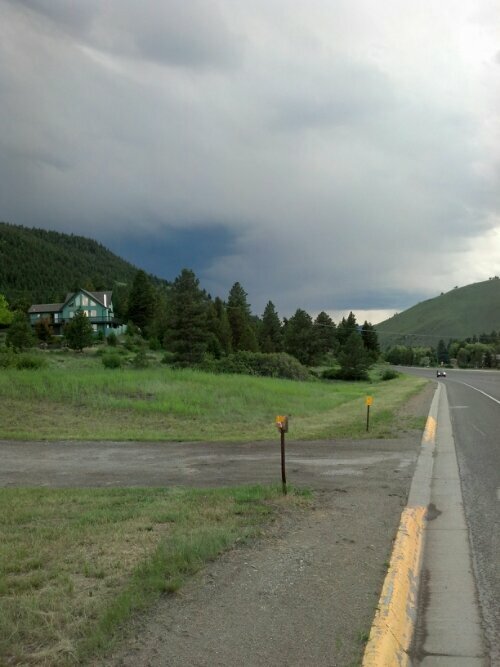 He was headed west toward Bonners Ferry on Hwy. 2 that I just traveled. After talking over lunch and giving pointers on the route, he left and I finished my Hubba Bubba sandwich. So good. As with almost every town out here it seems, another climb ensued to get out of town. Only 18 miles remained for the day, but my eyes took in every foot of it. In Libby, I found a nice RV park that welcomed tents. $12 got me a site with a picnic table, access to bathrooms, wifi, and yes, a shower! I’ve now gotten caught up with all my blogs. Hope I don’t fall behind again! Excited for another day tomorrow.